Paying rich tributes to Shaheed Udham Singh on his 66th martyrdom day at a state-level function organised at the New Grain Market here today, Mr Shamsher Singh Dullo, President of the Punjab Pradesh Congress Committee, criticised the Akalis for paying tributes to the militants killed during militancy period in Punjab and dubbed them as “cowards” for calling the “murderers” of innocent persons “martyrs. Punjab Deputy Chief Minister Rajinder Kaur Bhattal, PPCC President Shamsher Singh Dullo, MP from Patiala Preneet Kaur and Chief Minister Amarinder Singh pay homage to Shaheed Udham Singh in Sunam on Sunday. The Communist Party of India will ensure that the report of the Nanavati Commission, which probed the post Indira Gandhi assassination riots in Delhi in 1984, is tabled in both Houses of Parliament during the current session. Alleging that the Congress government has failed on all fronts in the state, BJP leaders said during its local bodies meeting that the inflation had increased manifold and the law and order situation in the state was at an all-time low. Even as the Chief Minister, Captain Amarinder Singh, has managed to work out a truce between the Punjab Finance Minister, Mr Surinder Singla and the Improvement Trust Chairman, Mr Jagroop Singh Gill, it remains to be seen as to how far it would check bickering between the two warring Congress leaders. Telephonic calls made yesterday by district officials at Sriganganagar, neighbouring Abohar, to senior political activists warned them against attending Mahapanchayat, scheduled to be held on Monday at Gharsana, by Kisan Mazdoor Beopari Sangharsh Samiti on canal water sharing issue. 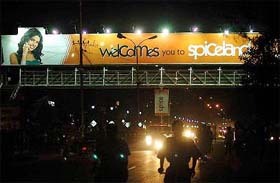 Throwing the directions of the Punjab and Haryana High Court to the winds, the Jalandhar Municipal Corporation has allowed a mobile phone company to display its huge, about 70 feet long, advertisement hoarding on the top of a newly constructed footbridge in front of the Inter-State Bus Terminus on the G.T. Road here. Since huge funds were distributed at the ‘sangat darshan’ programme launched by Mr Parkash Singh Badal, the state was left in a financial mess. When Captain Amarinder Singh became Chief Minister, he started with a bang. He had taken note of the situation prevailing in the state. For over 20 years, Mr Kartar Singh, settled in Canada, led a good, contented life. Then, he committed, what he terms, his biggest mistake. He bought land in Punjab. On a visit to Punjab, he participated in an open auction of a land at Jalandhar. Residents of Sirhind are without any power and water from the last 24 hours. Residents, who were getting drinking water from hand pumps, alleged that the Sirhind had become the most neglected town of the state. They said there was no power in the town since the last 24 hours. After Jajal, Gayana and Malkana villages, cancer has spread its tentacles to Mansa Kalan village where five cancer deaths have been reported in the recent past. Some of the families have lost their breadwinners and are finding it difficult to eke out their living. BSNL consumers are a harassed lot in this subdivision as almost in every village and locality of the town unattended complaints have been piling up for months. More than 8,000 telephone connections in 190 villages of the subdivision and the town of Sultanpur Lodhi are connected with eight telephone exchanges situated in different villages. ‘Sarhad Ke Rakshak’ (Protectors of border) - a documentary film on the Border Security Force, which has highlighted the various aspects of the force, has been completed. The compact disc of the film would be released on August 7 at Wagah joint checkpost. The Ramgharia Cultural Council, Punjab, today donated ration and fruit worth Rs 30,000 to the inmates of the local Pingala Ashram to mark the 25th death anniversary of Hindi film singer Mohammad Rafi. With the revival of heatwave in the region, two persons lost their lives here today. One of them was a beggar. Sources said an unidentified man was down with high fever at Patta Market. Three Lok Adalats were held under the chairmanship of Mr K.K. Kakkar, Civil Judge, Senior Division, here yesterday. The adalats settled 56 of the 71 cases and awarded Rs 14,51,804 as compensation to litigants. Broken door handle of a Maruti car led to the arrest of a gang of robbers involved in snatching of a briefcase from the branch manager of Allahabad Bank at Rattewal, disclosed Mr Arun Pal Singh, SSP, in a press release issued here on Saturday. The district police today claimed to have busted a five-member gang of looters and seized a .12 bore pistol, several other sharp-edged weapons and three mobile phones from them. The police has arrested five members of an inter-state gang of auto-lifters. The gang was specialised in stealing tractor trailers. Two tractors and 11 trailers have been recovered from them. A widow has been brutally murdered at Maur Khurd village reportedly with the intention of robbery. Sources said the deceased, Shimla Devi, was staying alone, and her murder came to light today morning. Family members and husband and in-laws of 15-year girl from a poor family were today arrested under the child marriage Act during the marriage function at a gurdwara in Kurali here. Four Mohali residents have been arrested by the Kharar police on the charges of cheating and forgery. A Kharar resident, Mr Didar Singh, working with the Punjab State Electricity Board in Sangrur had alleged that the accused, his relatives had “fraudulently grabbed” his land, measuring more than 4 kanals, costing Rs 30 lakh in Sante Majra village, after “drugging” him. The newly formed Rotary Club Of Fatehgarh Sahib in collaboration with Rotary Club, Patiala Greater, today organised a district level seminar on “ Excellence in service, literacy and education” at Mata Gujri College hall. Representatives of more than 72 Rotary Clubsfalling in Rotary District 3090 attended the seminar. The Desh Bhagat Group of Institutes, in collaboration with the Punjab Commerce and Management Association organised the 4th National Seminar on “Mergers and acquisitions in India” today at Desh Bhagat Institute of Management and Computer Sciences. Students at Gopi Chand Arya Mahila College here are getting free of charge training during the Handicrafts Week being observed for the first time to explore talent in home science. The college building has recently been renovated, and it wears a pleasing look now.